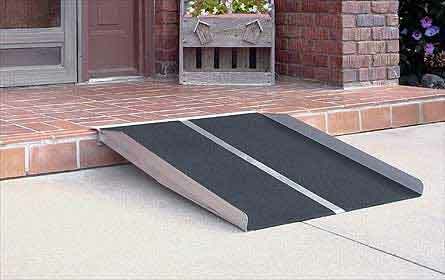 The PVI solid wheelchair ramp is a one piece, non-folding ramp. These ramps are ADA compliant when used at a 1:12 ratio and a 36" wide model is used. The wheelchair ramp features, 2" curb edge, non skid surface and all aluminum construction. Perfect for steps up to 5" in height (ADA) or a maximum of a 10" in height for private residential use (5' model.) Simply remove the ramp from the box and position it on your step. The solid ramp should be attached to your step with screws or bolts in order to keep the ramp from slipping off.